A dozen Christian men discover they have been invited to meet in person with Jesus Christ for two hours each week. Jesus has made it known that He would like to personally teach these men. He wishes passionately to hear their requests, to enjoy their company, and to help each of them to see that they are in fact members one of another–and members of the very Body of Christ of which He, Jesus, is the Head. Jesus is an intimate, relationship-orientated and intense man–superficial conversation, playing religion, or merely pretending to know Him, do not sit well with Him at all! Though there are millions of “professing” Christians in the world, only a handful of individuals in any given area are willing to “bother” with attending the meetings Jesus has invited them to participate in. The twelve (or so) real men under discussion in this short paper have dimly begun to see and experience a dimension of Christian experience that is exciting and transforming–far, far different than the usual Sunday morning at eleven o’clock church service the men have found often boring and of little value. Do we truly realize the power that is available to us? Do we have any concept of the power Jesus intended for His church to wield in this dark and dangerous world? Or has our vision of the church become so dimmed that the word “church” suggests to us only a building on the corner where we go once a week to sing hymns and hear sermons? Whenever the church has followed the biblical pattern and become more of what God designed it to be, righteous conditions have spread throughout society. When the church has abandoned this divine pattern, relying on worldly power, becoming proud, rich and tyrannical, then it has become weak and despised–and terrible forces of evil have been unleashed in the world. (Ray C. Stedman, Body Life. Naturally every man makes sure he arrives at the meeting on time and he sees to it that he has set aside the cares and confusion of the day so as to be tuned in to the invisible Presence of Jesus in the midst when the facilitator of the week opens in prayer. Jesus has desired to meet with His people for the past two thousand years. In most churches these days He is not really welcome at all. The paid professional staff has everything organized and in perfect control. Preachers today are slick and professionally trained and can deliver flawless messages week after week with no need to consult Jesus in any depth concerning what He might wish to say to His people. The choir and orchestra practice so that the music is perfectly performed, and guaranteed to help people relax. The good music has also been found to increase church attendance and the size of the offering as well. It matters little that the people in church are total strangers and never get to know each other. There isn’t time for that, and the people come from near and far anyhow, and don’t have time to waste getting to know their fellow Churchgoers. Jesus, it turns out, is a very gracious and sensitive gentleman. Though He has immense power at His disposal, He does not participate in the various gatherings of His people unless He is invited and welcomed. On those rare occasions when He iswelcome, He is all too glad to take over all aspects of the meeting. As a result there will be always be surprises and great blessing. Sadly, such gatherings are very rare these days! Travelers Unaware: “Why do people in churches seem like cheerful, brainless tourists on a package tour of the Absolute?…On the whole I do not find Christians, outside of the catacombs, sufficiently sensible of conditions. Does anyone have the foggiest idea of what sort of power we so blithely invoke? Or, as I suspect, does no one believe a word of it? The churches are children playing on the floor with their chemistry sets, mixing up batches of TNT to kill a Sunday morning. It is madness to wear ladies’ straw hats and velvet hats to church; we should all be wearing crash helmets. Ushers should issue life preservers and signal flares; they should lash us to our pews. For the sleeping god may wake someday and take offense, or the waking god may draw us out to where we can never return.” (Annie Dillard in Teaching a Stone to Talk). The twelve men in this core group have known the Lord long enough to realize that Jesus is seeking men who are faithful, dependable, as well as honest and open with Him and with one another. They need each other, so treating their weekly time together as a matter of low priority injures the entire group. Each member is vital, valued, and has been chosen by God. He is important to the whole, regardless of his gifts or level of maturity in Christ. If the men in this group are available on His terms Jesus will use them greatly–irrespective of their status in society or their educational level or background. If the men do not care who gets the credit for His working through them, Jesus is free to use the men practically without any limitations at all! Each of the twelve men comes from different churches. They range in age from young to old. They are single, married, and divorced. Strangely, the longer they have been meeting together the more diverse and different that each have become. But paradoxically their love and appreciation of one another has steadily increased. It did not happen all at once, but gradually the men came to see that sin in any one of their lives affects everyone else. Similarly new resurrection power obtained from Jesus by any one member was immediately diffused to benefit all the members. The life these men shared, “in Christ,” was a common life–they were brothers not only for this life but forever. They found they were on the same road together as traveling companions, and the way is the Way of the cross. What makes the journey exciting (and bearable) is knowing that Jesus leads the way as their Trailblazer and Elder Brother. Amazingly, rather than speaking audibly to the group during the weekly meetings, Jesus has chosen to speak through the individual members. So, what everyone has to say during the two-hour weekly meeting of the core group is usually important! But it is challenging for the brothers to each wait for the Spirit before speaking. Often the points of view brought forth by the brothers are diverse and multi-faceted–even radical–yet harmonious. Gradually each man comes to see the subtlety of his flesh–and the worthlessness of speaking and acting on one’s own energy and by self-effort. During the rest of the week some of the men sit in class rooms and take notes on the lectures–knowing exams are ahead. Most of the men have assigned duties and job responsibilities where they report to superiors through a chain of command. But their weekly meeting with Jesus is unlike either of these two situations. Authority in the meeting with Jesus is given to the members on the basis of their servanthood. Two hours spent in a personal meeting with Jesus passes quickly. It is very easy to forget that Jesus is the One who called the meeting in the first place. Jesus wishes to teach new truth (and to remind them of old truth) when they get together. For this purpose one brother, the weekly facilitator, has studied ahead. That individual man will seek to draw out the rest (as God leads him)–so all participate and learn from God’s word. The sharing time which follows the Bible study is vitally important. Not every man needs to contribute to the sharing time each week, and if he does, it ought to be something of interest and importance to Jesus and to the group. It is entirely possible that one brother needs special attention on a given week. Others may have nothing important to contribute that week. Jesus does not hand out a meeting schedule ahead of time–but He will guide by the Spirit if He is allowed to. 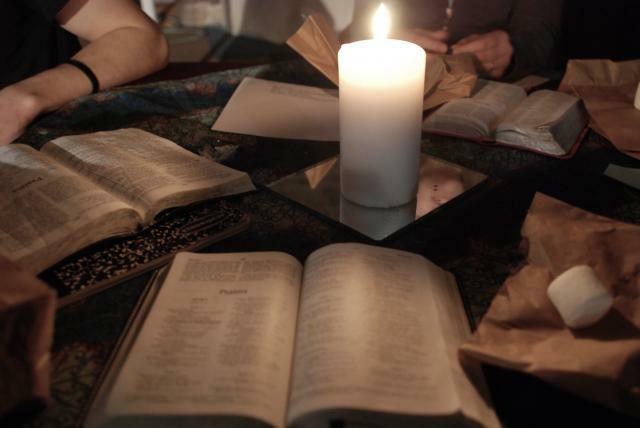 Because of all the events which transpire after two hours with Jesus their Leader, the men have found it of great value to spend time together apart from the weekly meeting–in prayer walks, social activities, Bible study and soul-searching interactions. Prayer is one of the most important parts of the weekly meetings with Jesus. But all too easily, in their enthusiasm to see one another, the individual brothers up most of the allotted time with irrelevant, unimportant, or trivial topics that would be best handled outside of the group meeting. When that happens the closing prayer time is hasty and perfunctory. In fact, Jesus has concerns for the entire outside world which he would like to communicate to His brothers. But only rarely do the brothers get beyond their own small self-centered minor problems so as to gain a global view of things from Jesus. Just as the individual brothers have come to discover that they are very self-centered human beings, so also without God’s help the group would turn inward also and become a place of escape and false security from the storms of life. When we are changed from within, when the inside of the cup is cleansed, our entire outlook on human relationships changes. Our natural inclination, when confronted with conflict and mistreatment, is to respond with “an eye for an eye.” But Jesus calls us to a new kind of response: “Bless those who persecute you.” This is the response the apostle Paul calls us to when he writes, “Live in harmony with one another..Repay no one evil for evil…Do not be overcome by evil, but overcome evil with good” (Rom. 12:14-21). The message God has entrusted to the church is the most revolutionary message the world has ever heard. Should we now surrender that message in favor of mere political and social action? Should we content ourselves with allowing the church to become just another worldly political or social organization? Do we believe God enough to agree with Him that it is Christlike love, lived out in the koinonia-community of His church, that will change the world–not political power or social agendas? God calls us to become individually responsible to spread the radical, revolutionary, life-transforming good news of Jesus Christ throughout society. The church must again invade commercial and industrial life, education and learning, the arts and family life, government and our social institutions with this tremendous, transforming, unequaled message. The risen Lord Jesus Christ has come among us to implant His own never-ending life within us. He is ready and able to transform us into loving, compassionate, confident people, empowered to cope with any problem, any challenge life sets before us. That is our message to a weary, fearful, sorrowing world. That is the message of love and hope we bring to a hostile and despairing world. Core groups are great! They are awesome supernatural encounters with the Living God–when we allow them to remain leaderless, when we come expecting Jesus to show up and take over. This entry was posted in Guest Commentary and tagged Christianity, Church, Discipleship, God, Jesus, The Bible. Bookmark the permalink.